Macmillan has released the trailer for Dreamland by Alyson Noël’s third installment to her Riley Bloom series. I personally am not an Alyson Noël fan but I couldn’t say no to passing on the info as well as hosting the giveaway for my readers. Enjoy the trailer and good luck with the giveaway! "Riley’s finding that the afterlife can be a lonely place when all you do is focus on work. So she goes to the place where dreams happen, hoping to find a way to contact her sister, Ever. She meets the director, who tells her about the two ways to send dreams. As a Dream Jumper, a person can jump into a dreamer’s dream, share a message, and participate. As a Dreamweaver, an entire dream can be created in a studio and sent to the dreamer. But Dreamweaving was outlawed decades ago, and the studio was boarded up. Thinking it’s her only way to reach out to her sister, Riley goes in search of the old studio. There she finds a ghost boy, who’s been creating and sending nightmares to people for years. In order to stop him and reach out to Ever, Riley is going to have to confront and overcome her own fears." 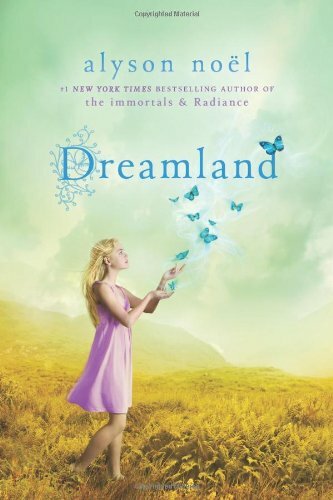 Macmillan would like to give a copy of Dreamland to one of my readers! To enter please fill out the Rafflecopter entry form below! That’s great to hear. I hope Alyson gets better as a writer with every book she writes. I unfortunately gave up on her with the second Ever book.